Nowadays, the trend of video calls has increased significantly. Interview or personal talk people are using video calls. If the background behind you is not good when you are making a video call, then there is a wrong impression on the front. Especially when you are interviewing, the background of your video call should be better, otherwise the front does not look good. So today we are going to tell you about blur background in Skype video calls. During Skype video calls, you can blur the background in two ways. Let us know that Skype has recently started this feature. To use this feature, your Skype App should be updated in the latest version. 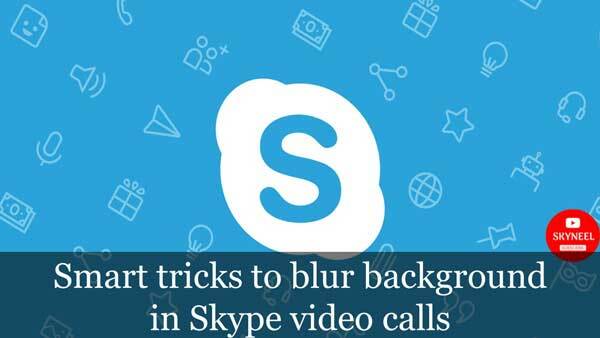 In the first Method you can blur background in Skype video calls. For this you need to first open your Skype app. You can also use this app in PC or mobile. Today we are going to tell you about the settings of the PC app. 1. Start the video call with any of your contacts after opening the app first. 2. After the video call starts, go to your camera feed and right-click it. 3. Right-click you will see a variety of options. You can choose Blur My Background by going into these options. 4. After this there will be focus on your face and the back things will get blurred and the background will become blurred. In this manner you will not need to start a video call. You can also blur your background chat without even starting a call. 1. First you open the Skype app. 2. Now you go to the call screen and click on the gear icon. This gear icon will get you right on top. 3. After this you will need to go to the Audio and Video Settings menu. 4. In Settings you will see Blur the Background option. After this, front faces will be on your face only. They will see the background behind you blurred. If you want to unblock your background, you can unblock the background by going back to the audio and video settings. In this article, we told you about blur background in Skype video calls. If you liked this article, you can also like our Facebook page and also subscribe to our YouTube channel. If you have any problems related to this article, you can tell us by commenting.